Seattle Colleges can be tuition-free! Let’s create a vision together about how that should happen! The mayor has announced that she plans to fund tuition-free community college for graduates of Seattle Public Schools. We want to hear what students have to say concerning what the Seattle Promise program should look like. Everyone deserves access to a college education, and that includes access to books, transportation, housing, and much more. 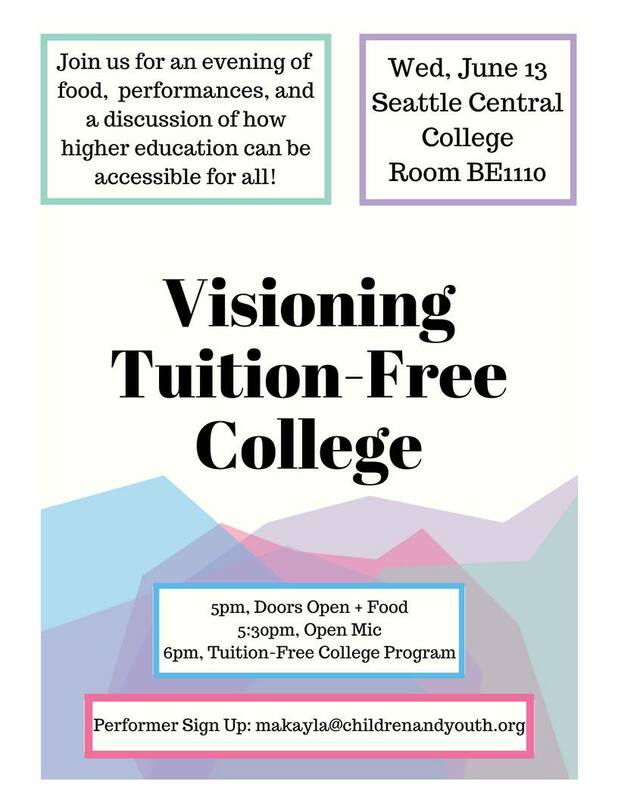 Join us for an evening of free food, fun performances, and an inclusive community discussion about Seattle student access to higher education! Accessibility Information: The event space is located on the first floor of the Broadway Edison building. It’s wheelchair accessible and next to two gender-specific restrooms. There is a gender-neutral restroom on the third floor, which is elevator accessible. The street car and lightrail get within a few blocks of Seattle Central College, as well as Metro routes 9, 43, 49, 60, and 11.